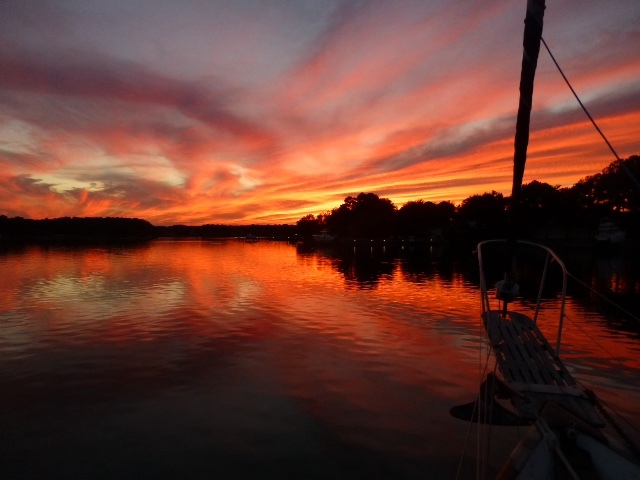 On September 4, Wes and I left Havre de Grace, past our usual first port of call, Annapolis, and were anchored in Galesville by evening. We had stopped there some years ago. Day 2 - Our next stop south was another one of our regular stops - Solomons. 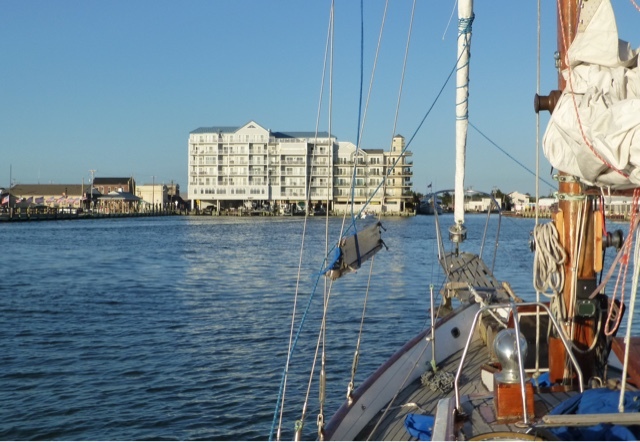 On the Petuxent River, it has a few bars and restaurants ashore, but we never got off the boat. Day 3 - On leaving Solomons, we sailed across the bay to Chrisfield, a spot we had visited some years ago. While in route, we stopped the boat in the middle of the bay and went for a dip. It was very refreshing. 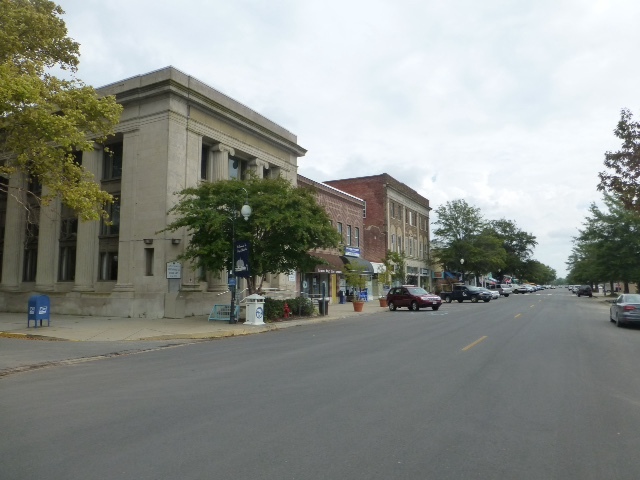 In the morning, we walked around the quiet town with broad Main Street looking for ice. Finally found it at Big Willies. We left soon afterwards. 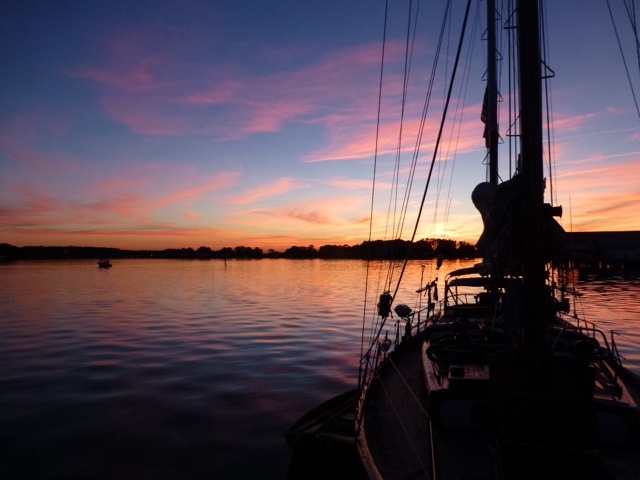 Day 4 - We stayed on the East bay and sailed to Onankoch. It has a long and windy channel that goes up, the Onankoch Creek. That afternoon, we took a walk downtown and found some of the same stores we had visited some time ago - an antique store where Wes had bought a wine corker, and a wine and kitchen gift store. Onankoch has an old townfeel. 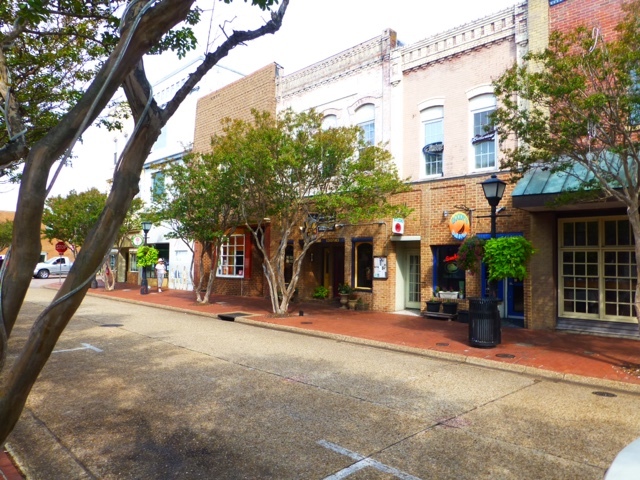 It's quite charming with a number of classic old homes and store fronts. Day 5 - Cape Charles, Virginia - Docked at a marina at night after tearing clew off genoa. The following day we took the fold-up bikes to Food Lion, a big grocery store, to stock up on some supplies. A very dark stormy cloud threatened us in the late afternoon. The sky became dark and eerie looking, particularly with the dust it kicked up from the gravel and cement operation at one end of the basin. Day 7 - Hampton Roads, Virginia anchored in Hampton after an easy sail across the bay from Cape Charles. No incidences. 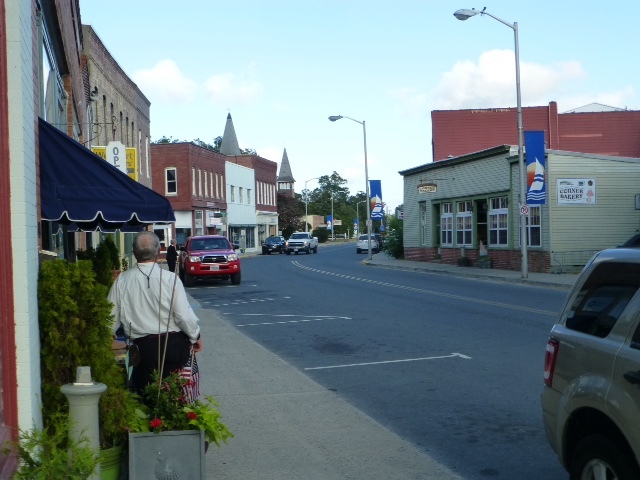 In the morning, we walked around the town of Hampton. Nice but very small. Ricky Skaggs was scheduled to play at a venue near the boat. But due to the impending rain they moved it to a place further off. We then took the bikes to visit Fort Monroe and on the way back stopped at a waterfront restaurant and had a bottle of Pinot Gris with an order of fish & chips - very tasty. Wes replaced starter. We now can start the engine at will. Nice. 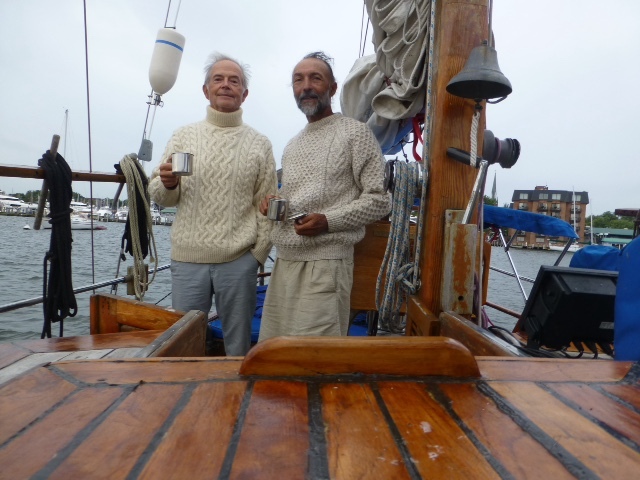 Day 10 - After three nights at Hampton, we pulled up anchor and headed north. With the little wind there was against us, we opted for a short run, pulling into Mobjack Bay. 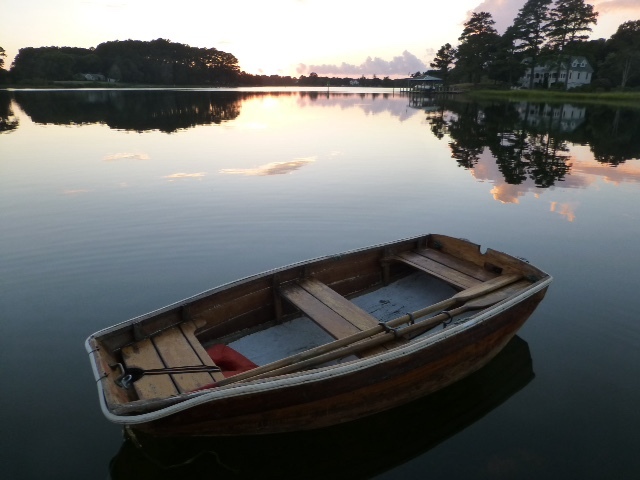 Of the several rivers we had to chose from, we opted for the East River, a river noted for its beauty and tranquility. 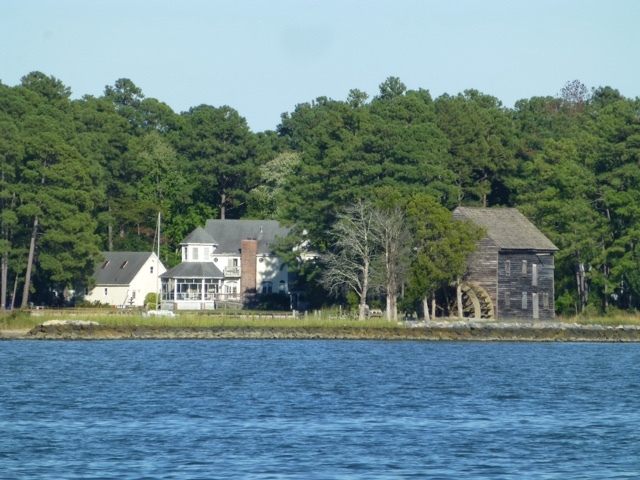 As we motored past homes and densely wooded shoreline, our coastal navigation book noted that one of the homes we past that had a wooden structure with a paddle wheel alongside of an elegant white southern-style home, once belonged to John and Yoko Lennon. Imagine. We anchored after another mile, just north of a wharf. Indeed it was a peaceful, tranquil spot. In the evening, the only sounds were of the crickets. The skies were emblazoned with stars. Day 11 - The following morning, after a hearty breakfast of bacon, eggs and cheese wrapped in a tortilla with salsa, we moved onward to a new spot further north. The trip was uneventful - the little wind we had was on the nose again. By mid-afternoon, we were in position to enter the channel for Gwynn Island. It was a curvy, narrow channel with a drawbridge at one end. We radios ahead to request for it to open, which they did, but with a slight delay, forcing us to make a quick loop at the very last minute. Once through, we followed a couple of markers and promptly ran aground in mud. We tried backing down, but to no avail. 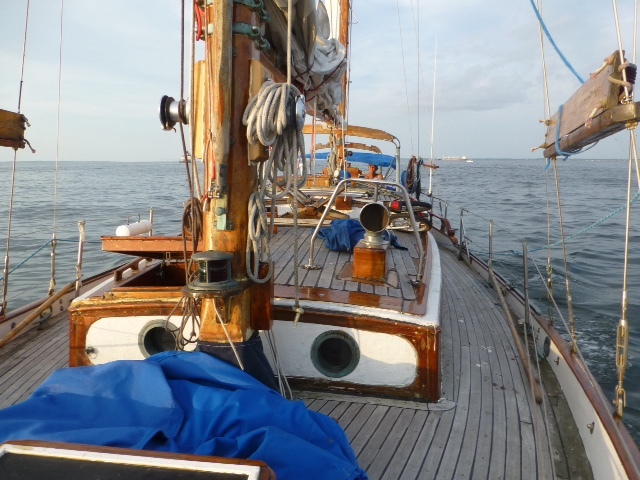 We then tried kedging off, using a small anchor! But that too failed to pull us off. We then decided on the course of least resistance by having a beer and wait out the tide. It would soon be an incoming tide. 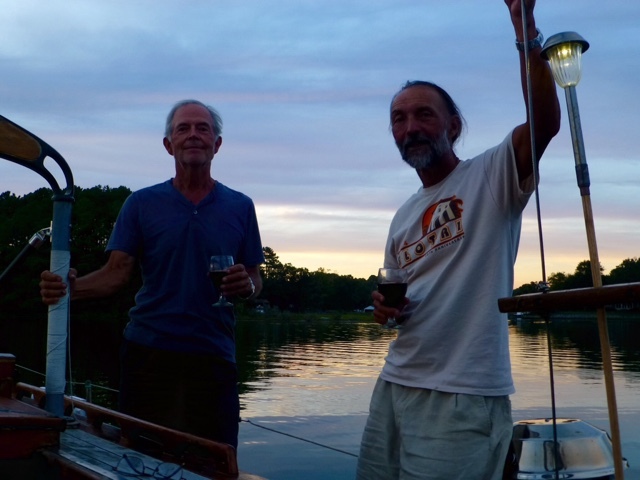 Several hours later, after eating dinner and having a glass or two of a cab, we floated off and anchored nearby in deeper water. Day 12 - We were under way early, returning through the bridge opening by 10:30a.m. We decided to head for another anchorage neither of us had been to - Indian Creek. After one attempt to anchor failed due to poor holding ground, we ventured down the Indian River to Henry's Creek. 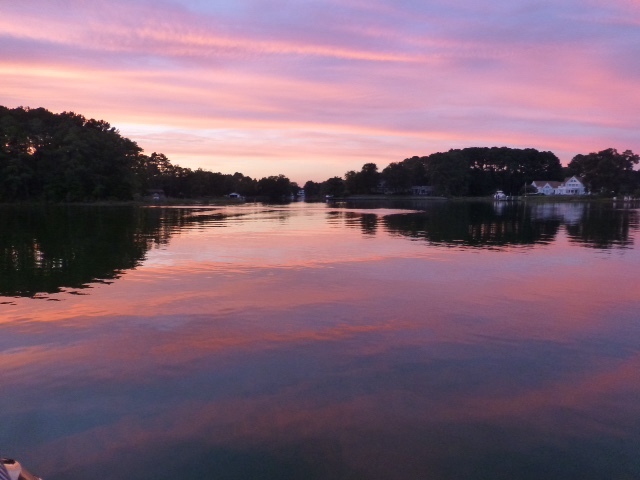 We found it to be a beautiful and tranquil bay with good depth and holding ground. The evening sunset was incredibly colorful. 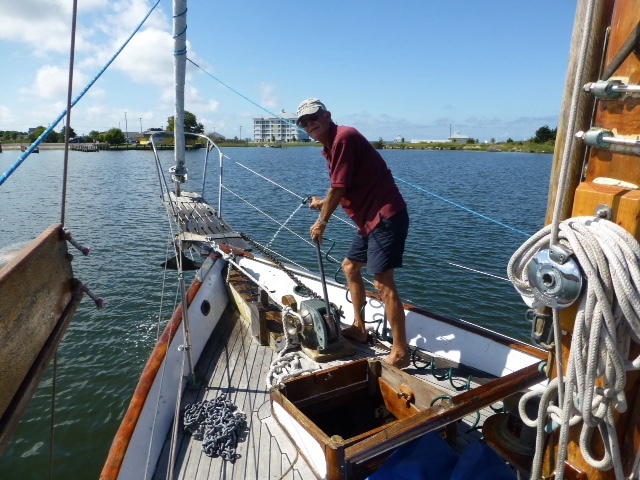 Day 13 - We had a very leisurely morning, since we were only going a few miles north to Reedville. 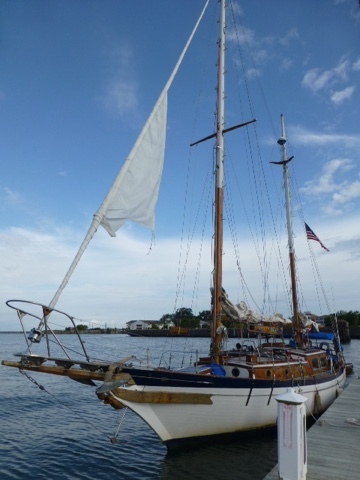 With nearly calm wind conditions, After a few hours of motoring we were anchored in Reedville. 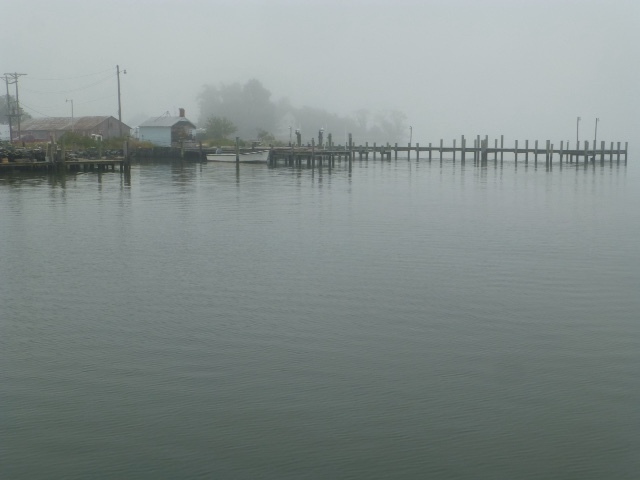 Known for its menhaden fish industry (from which Omega oils and fertilizer is made), this once thriving town is slowly fading away. We took the bikes to shore expecting to find a grocery store nearby but found out that the last grocery store in town was shuttered a couple of years ago. We bicycled five miles further to find a Dollar store with minimal supplies. 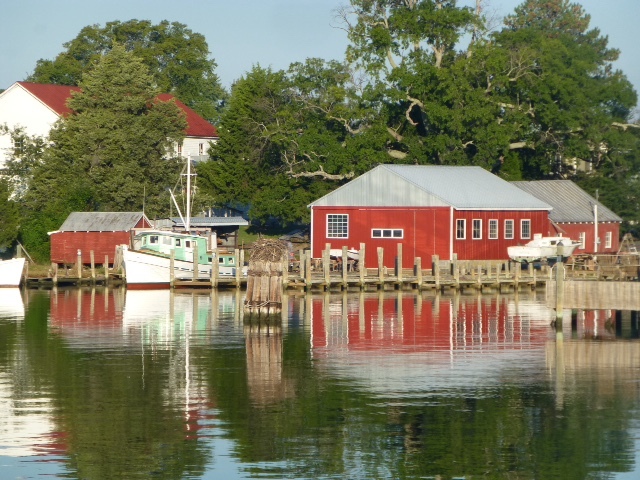 Still Reedville is a picturesque place. 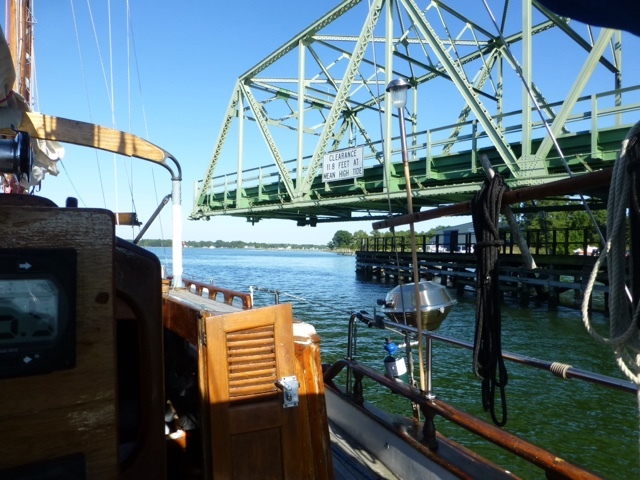 Day 14 - We left Reedville after breakfasting on a bacon and egg burrito. 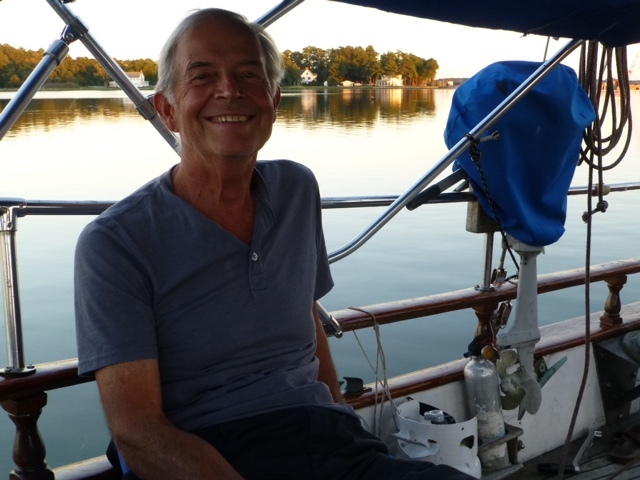 With the high pressure area remaining with us, we motored most of the way to the mouth of the Potomac River. The trip,was uneventful except for the sighting of a floating, bloated deer carcass. I hadn't expected the mouth of the Potomac to be so wide - 7 miles. 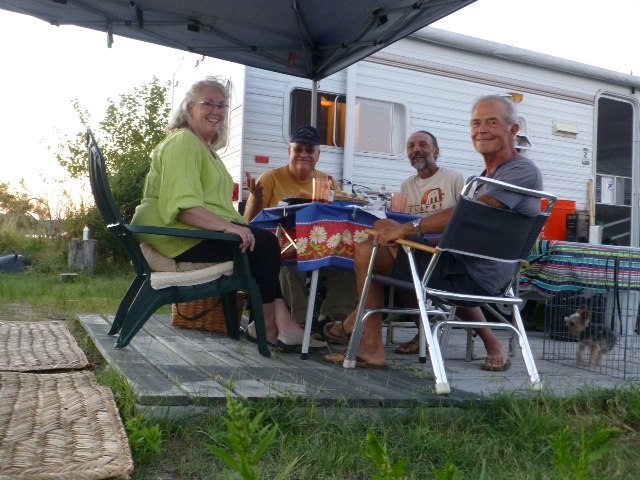 We were on our way to see Mike and Ann, friends of Wes', who owned a weekend trailer on the river banks, near Smith Creek. Mike was there to greet us at the dock. In the evening, we had dinner with Mike and Ann, enjoying a fire and good conversation. Day 15 - Woke up to very dense fog in the harbor. It made the surroundings even more tranquil. After coffee and breakfast, we got underway and set a course for a return trip to Solomons. Just outside of the harbor, we caught a blue fish. 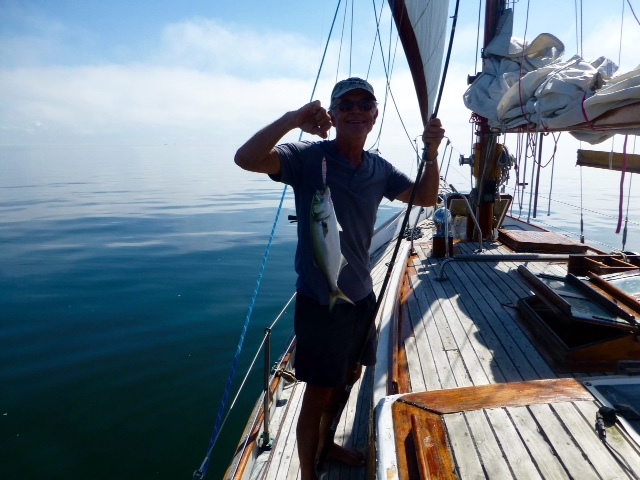 Besides catching a fish, we were fortunate that day to actually be able to sail into Solomons. Day 16 - The breeze was a little stronger in the harbor in the morning, but we had no idea of how gusty it was outside on the bay. 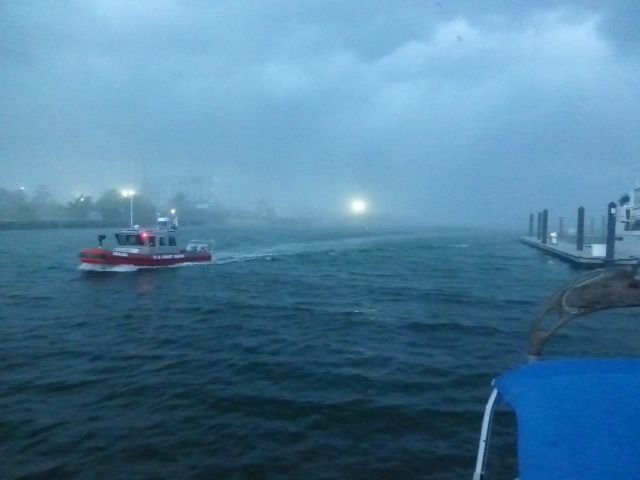 Once we were out there, we had 3-5 foot chop against us with gusts to 25 mph. 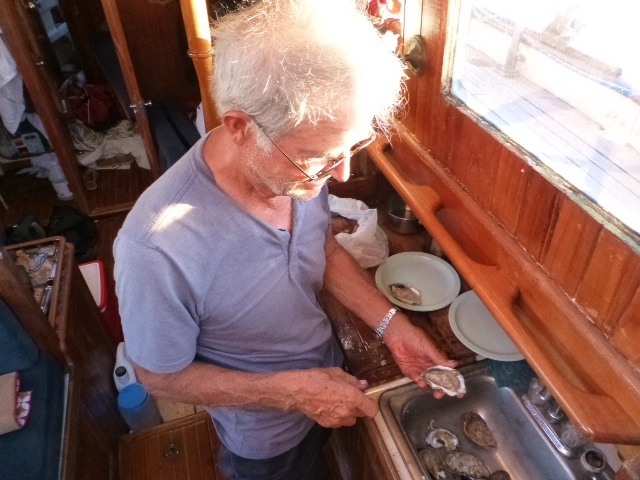 After a bit of pounding into the weather, we made the sensible choice of coming back in to the harbor and re-anchoring. 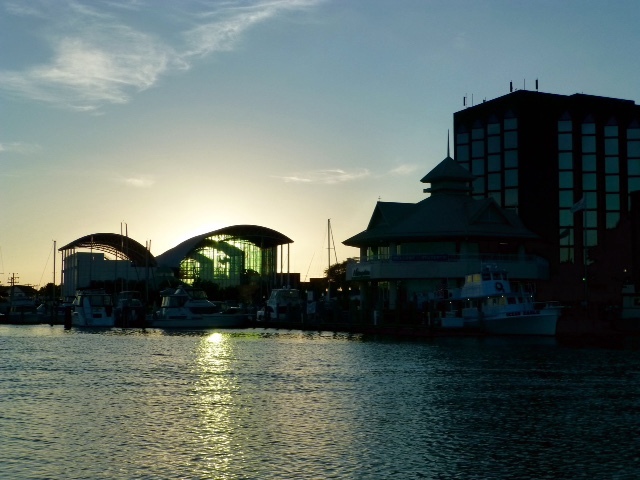 The following day, we went to a watermen's boat docking competition event that was being held in the harbor. It's more or less their version of a cowboy rodeo. A display of power and skill, as the big boats are quickly maneuvered around pylons, four rings placed around each of them, and it's all done in less than 30 seconds. The next day we faired much better, though the wind continued to be from north - just where we were heading. 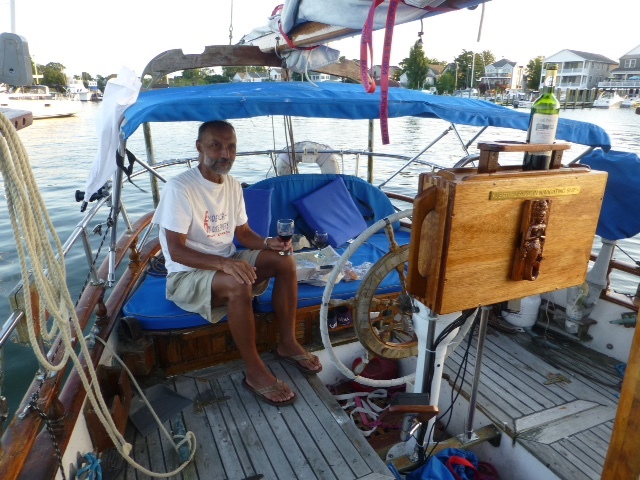 After about 12 hours of motor sailing we got into Annapolis and took a mooring. We didn't go to shore, instead just had dinner and Wes opened up a bottle of champagne. 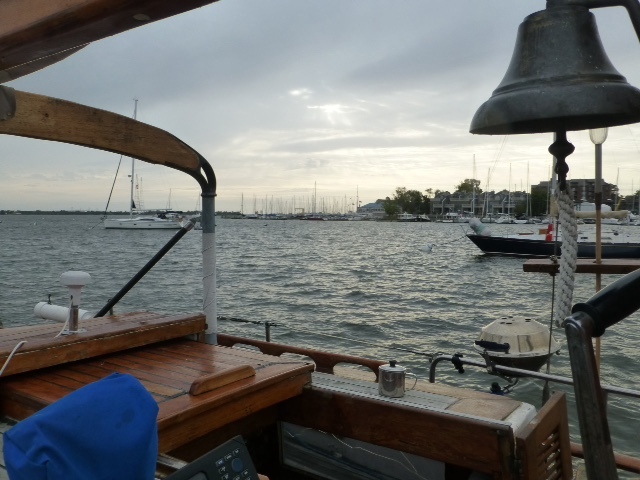 The following day, we left early after a cup of coffee - it was going to be another long day on our return to Havre de Grace. We picked up the mooring line just after dark. Another good Chesapeake Bay cruise had come to an end.